There are plenty of us out there that just have a bit of an insecurity — sometimes a flat-out fear — of dropping our drawers and facing the world full monty. That's not so strange! Going out in the buff can be pretty intimidating! Plus, where are you supposed to put your stuff!? 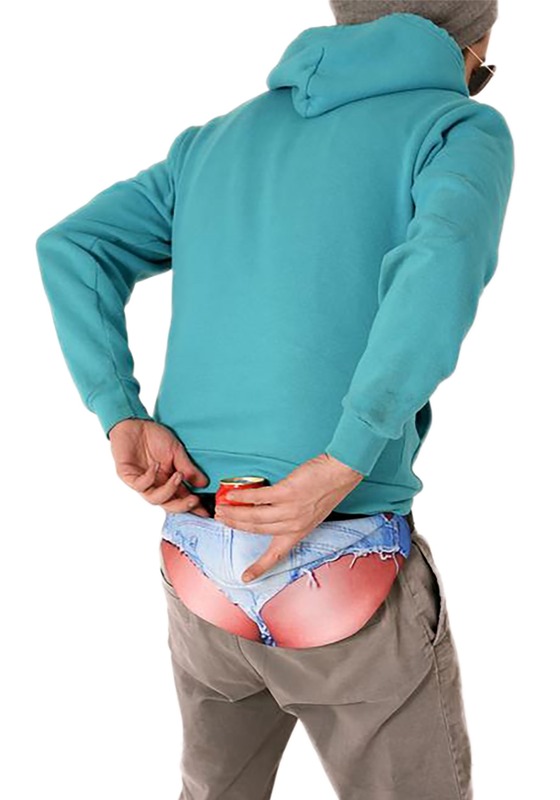 But, for those that have a fear of being anywhere sans clothing (and the pockets that come with it), there are solutions to help you ease your way to the naked truth and find comfort where it may not have been previously. Keep your stuff secured and feel like you're showing off just a bit more than usual with this unique Fanny Pack. Featuring the image of a pair of really short jean shorts, this pack measures 15x6 inches and has a foam construction to help it maintain its shape while the length-adjustable belt fastens around your waist. You should have no shame in showing off your stuff to the world, but that fact doesn't mean it can't be a bit spooky to get there. Stretch your legs into a new comfort zone when you take this Fanny Pack literally and put your junk in a literal trunk.